Picture from osullivanm : Yeah .. my final county highpoint!! Picture: Yeah .. my final county highpoint!! It's difficult to know how to describe this county highpoint. 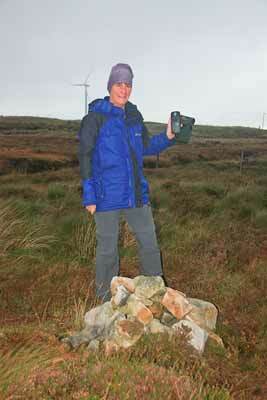 It was possible to drive up the access road to the windfarm to within 94 metres of the top. A few minutes later , I had completed my final, 27th county top. The experience was a very interesting meander into the developing world of wind power in the midlands. There's a tremendous elegance about these modern windmills as they whirr gracefully in this bleak spot.